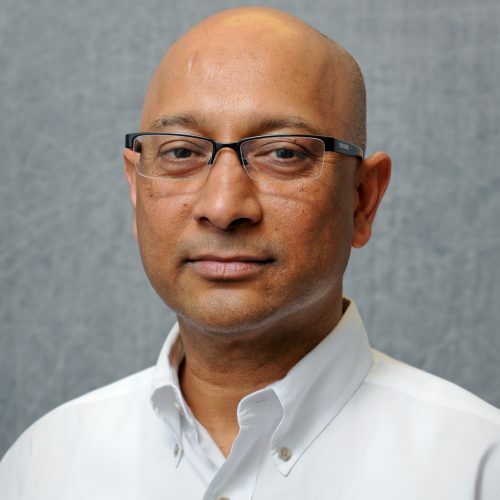 Tasnim Hassan is a faculty member in the Department of Civil, Construction, and Environmental Engineering at North Carolina State University (NCSU) since January 1995. At the undergraduate and graduate levels, he teaches courses related to mechanics, strength of materials, fatigue, fracture, and constitutive modeling (CE214, CE313, CE515, CE718). Currently, through one National Science Foundation, two U.S. Department of Energy and one Honeywell Aerospace projects his research group (graduate students: Farhan Rahman, Heramb Mahajan, Urmi Devi, Dhanushka Palipana, and Research Assistant Professor Dr. Machel Morrison) is making efforts in understanding very high temperature fatigue-creep failures of modern alloys. The experimental data and constitutive models to be developed through these projects will allow accurate life prediction and thereby safer and economical design of critical high temperature components. His research, education, and professional activities are geared toward understanding failure of structures subjected to extreme loading conditions, advancing constitutive models for more accurate prediction of structural failure, and finally develop techniques for enhancing resilience of structures. Dr. Hassan is interested in experimental, constitutive modeling and simulation modeling research towards understanding and modeling failures of steel structures and welded joints, concrete structures, and high temperature components in nuclear and fossil power systems and jet engines. Islam, N., Dewees, D. J., Cooch, M., & Hassan, T. (2017), In Proceedings of the ASME Pressure Vessels and Piping Conference, 2017, Vol 3B. Islam, N., & Hassan, T. (2017), In Proceedings of the ASME Pressure Vessels and piping conference, 2016, vol 5. Islam, N., & Hassan, T. (2017), In Proceedings of the ASME Pressure Vessels and Piping Conference, 2017, vol 8. Quayyum, S., & Hassan, T. (2017), Journal of Structural Engineering (New York, N.Y.), 143(5). Honeywell Aerospace is interested to develop a USERMAT subroutine in ANSYS to analyze the deformation behavior of wrought Haynes 282 (HA-282) combustor liners. The commercially available nonlinear finite element codes such as ABAQUS and ANSYS, which are used for the analysis of such components, do not have the proper constitutive model in their material libraries. Hence, it will be necessary to develop an experimentally validated advanced constitutive model and develop necessary numerical scheme to incorporate the model into the ANSYS USERMAT subroutine in order to perform combustor liner and other high temperature structural analyses. Honeywell Aerospace will develop the needed set of high temperature experimental data through consultation with the NCSU investigators. A group of investigators from several universities and industrial organizations (with University of Wisconsin as the lead) proposes to advance the state of the ASME section III code (nuclear service) for compact heat exchangers (CHXs). This proposed project will advance the technical knowledge of CHXs and lay the foundation necessary for of CHXs to be certified for use in nuclear service. During the course of this project the investigators will advance the understanding of the performance, integrity and lifetime of the CHXs for use in any industrial application making their use more attractive and accessible to industry. This will be achieved by developing qualification and inspection procedures that utilize non-destructive evaluation (NDE) and advanced in service inspection techniques, with insight from an industrial utility leader, EPRI. ASME Code experts on section III from MPR associates will direct the testing and help to develop a series of documents that define the rules and regulations for use of the CHX with input from members of the ASME section III committee. Currently, CHXs are covered by design rules in the ASME Code, Section VIII, Division 1, which is limited to the maximum temperature of 427oC, hence cannot be applied to the intermediate and secondary heat exchangers in Sodium Fast Reactors (SFRs) and High Temperature Gas-Cooled Reactors (HTGRs) with maximum outlet temperatures 550oC and 950oC, respectively. No detailed design strategies for the CHXs in the temperature range 550-950oC have been published. Through this IRP and earlier CHX projects sponsored by the US DOE, the investigators at NC State University (NCSU) will develop high temperature material properties of diffusion welded laminated structures for Alloys 617 and 800H, and Stainless Steel (SS) 316H. A set of isothermal tension, creep, fatigue and creep-fatigue tests on diffusion welded Alloy 800H will be performed and combined with the diffusion welded Alloy 617 and SS316H data from earlier CHX projects to determine the elevated temperature material properties of these ASME Code approved materials. NCSU will perform isothermal burst, and steady and cyclic pressure experiments on diffusion bonded small CHX cores of Alloy 800H, and again will combine with the earlier CHX test results on Alloy 617 and SS316H to explore the influence of sharp channel corners and thermal stresses on the failure modes. NCSU will implement a recently developed advanced unified constitutive model (UCM) in performing full inelastic analyses of CHX to provide insight on the failure responses observed in the CHX experiments to be performed through this proposed IRP. The primary outcomes of the NCSU tasks will include, i) a set of high temperature fatigue, creep, and fatigue-creep properties of three ASME Code approved materials, ii) a set of fatigue, creep and fatigue-creep test data of diffusion welded CHX cores of these materials, iii) experimentally validated UCMs and corresponding model parameters of the ASME Code approved materials, and finally iv) insight on the influence of sharp channel corners and thermal stresses on the failure modes of CHXx. These outcomes will facilitate the development of an elastic perfectly plastic (EPP) analysis based design methodologies for CHXs, background document for incorporating the EPP based structural design methodologies as an ASME Code case in Section III, Division 5, and NDE and service inspection methodologies. The project tasks will be accomplished through integrated efforts of one PhD and one undergraduate students, and two NCSU faculty members. The PhD and undergraduate students will perform the analysis and experimental tasks under the supervision of the faculty members. Through performing the research tasks and interacting with other university researchers and industry experts, graduate and undergraduate students will be trained for the future work force of the nuclear power industry. The proposed project will implement the recently developed elastic-perfectly plastic (EPP) analysis methodologies in accordance with the ASME Code, Section III, Division 5 for diffusion welded compact heat exchangers (CHXs) in high temperature nuclear service. Burst, and cyclic pressure and thermal experiments on diffusion bonded CHX specimens of SS316L and Alloy 617 will be performed for investigating stress concentrations at sharp channel corners and determining possible failure modes. Hybrid and printed circuit heat exchangers (H2X and PCHE) meet the requirements of space and weight savings, high thermal effectiveness, low pressure drop and high design pressure capability. These attributes improve cost and efficiency of advanced reactors and thereby advances DOEâ€™s goal of carbon-free energy production. Currently, CHXs are covered by design rules in the ASME Code, Section VIII, Division 1 along with Section IX procedures for diffusion welding. But the Section VIII rules are limited to the maximum temperature of 427oC, hence cannot be applied to the intermediate and secondary heat exchangers (IHXs and SHXs) in Sodium Fast Reactors (SFRs) at 550oC and in high temperature gas-cooled reactors (HTGRs) at 950oC). No detailed design strategies for the CHX at the temperature range (550-950oC) have been published. For the IHXs in SFR and HTGR, thermal stresses, fatigue and creep deformation and rupture life limits must be considered for Section III, Division 5, Class A applications, and these are not covered in the Section VIII design methodology. Some IHX and SHX applications are anticipated to operate at significant pressure differentials in addition to cyclic thermal conditions. Hence, determination of thermal stresses in addition to primary stresses is essential for the calculation of creep strains, thermal deformations and peak stresses for fatigue and creep/fatigue usage estimates. It is anticipated that the thermal stresses in the diffusion bonded core will be large, especially during transients. Also high thermal strain concentrations are expected in the core near sidewalls, as well as at header attachment welds. On some scales, these concerns may be best addressed by the recently introduced EPP analysis methodology proposed for the evaluation of primary loads, strain limits and creep-fatigue in Division 5 of the ASME Code. Current Division 5 rules using simplified elastic, and decoupled creep and plasticity analyses have been deemed inappropriate for elevated temperature applications. Hence, EPP methodologies which considers creep-plasticity interactions will allow limit to various stress measures and strain limits. This project will perform a systematic set experiments on stainless 316L and Alloy 617 ASTM coupons and CHX specimens to develop structural design methodology based on EPP analysis in order to provide assessment of the elevated temperature failure modes of two types of CHXs under sustained and cyclic thermal and pressure loads. The research will be performed in consultation with the industry and ASME Code experts such that the outcomes can be used as technical basis for Section III, Division 5 ASME Code Case for CHXs in high temperature nuclear service. Sponsor: Babcock & Wilcox Power Generation Group, Inc.
Grade 91 (modified 9Cr-1Mo, or 9Cr-1Mo-V) martensitic steel is an important material in the domestic and international power generation industries. It is the default material for high temperature steam outlet headers and main steam piping around the world. The material relies on a specific state of microstructure to ensure its excellent high temperature strength, but changes to this microstructure, and a subsequent loss of strength, often occur in operation due to strain cycling and aging. There is a very large class of pressure equipment that sees only a few hundred cycles over its lifetime, although of typically significant strain amplitude. This equipment usually sees creep and plasticity occurring independently (time-independent plastic straining followed by high temperature relaxation, or vice-versa). For this class of problem, creep damage is the focus and fatigue (or plastic strain) is the quantity lumped into the damage properties, margin or calculation procedure. This is the type of equipment and the operation that is of concern in this project. Hence, for feasible design development for components of such pressure equipment, it is essential to develop advanced constitutive models to simulate the tertiary creep, low-cycle fatigue and creep-fatigue responses of Grade 91 steels. As such, meaningful predictions of time-independent strain, short term relaxation and long term creep and failure can be predicted with a single model. Emphasis will be given on the actual damage and failure prediction rather than extremely exact strain responses. Hence, the project is envisioned to be executed in two phases, with the first phase dedicated to the development of a one-way coupled viscoplasticity-Omega model, and the second phase dedicated to the development of a two-way coupled viscoplasticity-Omega model, and subsequently a robust unified viscoplasticty model. All models to be developed will be validated against a set of uniaxial experimental responses to be acquired from published literature. The proposed research will build upon a current investigation to develop a unified constitutive model intended for design-by-analysis of the intermediate heat exchanger (IHX) for a very high temperature reactor (VHTR) design of next generation nuclear plants (NGNPs). Model development requires a set of failure data from complex mechanical experiments to characterize the material behavior. Therefore uniaxial and multiaxial creep-fatigue and creep-ratcheting are being conducted on the nickel-base Alloy 617 at temperatures of 850 and 950 °C. The time dependence of material behavior, and the interaction of time dependent behavior (e.g., creep) with ratcheting, which is an increase in the cyclic mean strain under load control cycling, are major concerns for NGNP design. The proposed research is aimed at characterizing the microstructure mechanisms activated in Alloy 617 by mechanical loading and dwell times at elevated temperature. The acoustic harmonic generation method will be researched for microstructural characterization. It is a nonlinear acoustics method with excellent potential for nondestructive evaluation, and even online continuous monitoring once high temperature sensors become available. It is unique because it has the ability to quantitatively characterize microstructural features well before macroscale defects (e.g., cracks) form. The nonlinear acoustics beta parameter will be correlated to microstructural evolution using a systematic approach to handle the complexity of multiaxial creep-fatigue and creep-ratcheting deformation. Limited mechanical testing is proposed to supplement the current investigation and provide a full spectrum of data for: thermal aging, tensile creep, uniaxial fatigue, uniaxial creep-fatigue, uniaxial creep-ratcheting, multiaxial creep-fatigue, and multiaxial creep-ratcheting. Thorough microscopy, including High Resolution Transmission Electron Microscopy (HR-TEM), Scanning Transmission Electron Microscopy (STEM), Energy Dispersive Spectroscopy (EDS), and Scanning Electron Microscopy (SEM), is required and will be conducted to correlate the beta parameter with individual microstructure mechanisms. The acoustic harmonic generation method is well developed for longitudinal waves in large specimens. Higher harmonic generation in thin plates is becoming better understood and some success has been achieved. We propose to research applying the method to tubular mechanical test specimens, and eventually pipes for nondestructive evaluation. Tubular specimens, samples sectioned from these specimens, and pipes will all act as waveguides, thus we will apply the acoustic harmonic generation method to guided waves in shells. Coupling ultrasonic transducers to the shell sample will be achieved to generate a pure mode and receive low amplitude harmonics. The diverse project team, which includes a minority institution, enables the results of the microstructural evolution characterization to be employed for remaining useful life prediction. The unified constitutive model currently being developed for design purposes will be adapted for life prediction by correlating the beta parameter evolution obtained from nondestructive evaluation (or eventually online monitoring) to the model?s internal state variables. Such a microstructure based constitutive model will enable improving the ASME-NH code for Alloy 617. Honeywell Aerospace is seeking the development of time independent and time dependent plasticity models for analyzing the constitutive response of metallic alloys which are employed in gas turbine engines. The alloys range from low strength materials such as HA-230 and Hast-X to intermediate strength alloys such as Ti-6-4 and Ti-6-2-4-2 to high strength alloys such as U720LI, DP718. This study will develop constitutive model for simulating thermo-mechanical responses of HA-230. The temperatures range will vary from room temperature to as high as 1800F. At elevated temperatures, time dependence of deformation is expected to play a significant part. The phenomena that have to be included in an all encompassing constitutive model are (i) the hysteresis and Bauschinger effect, and strain hardening and softening and (ii) stress relaxation and time dependent creep at peak stresses. Development of advanced constitutive models helps in improving accuracy and fidelity in prediction of stress and strain redistribution in engine components during service. The redistributed stresses and strains are parameters that are used to assess the useful life of a component. Models for predicting component lives are developed from specimen coupon tests, the results of which embody stress redistribution according to at least one of the phenomena mentioned above. Past performance of spirally welded pipe piles has been questionable, however, advantages related to quick delivery and cost make their use attractive. As a result, the project described in this proposal has been developed to identify the required information needed by structural engineers to make a proper judgment on the use of these piles in coastal applications subjected to storm surge and wave action. Spirally welded pipe piles are manufactured in a manner that may result in various categories of welded joints (examples of three are shown in Fig. 1), any of which at or near the plastic hinge zone of a pile may impact its performance. The location of the plastic hinge zone in the ground will depend on the stiffness of the soil and pile diameter. The three scenarios of weld categories shown in Fig, 1 represent the simplest, which is spiral only (Fig. 1a) to most complex, which includes a spiral, skelp and splice weld (Fig. 1c) . This project will conduct experiments to determine the load-displacement responses under a load history that would mimic the effects of surge loading as well as to determine failure mechanisms for these three welds located at the plastic hinge of the pile. An innovative technique for improving seismic performance of steel beam-column connection with the advantages of the reduced beam section (RBS) connection, but with improved energy dissipation. Through a pilot study the concept is validated numerically at NC State University. This proposed research will conduct a systematic set of beam-column connection experiments for evaluating the novel seismic performance enhancement concept. The novel concept involves heat treating sections of beam flanges by exposing these sections to very high temperatures for certain amount of time before slow air cooling. Such heat treatment reduces the strength of steel in the heat treated areas of the flange. Consequently, under seismic loading plastic hinge develops at the heat treated beam section (HBS). Among the three moment resisting connections prequalified for special and intermediate moment frames by the 2005 AISC 358 standards, the reduced beam section (RBS) is the most popular because of its seismic performance and cost effectiveness. In the RBS connections, ?weakening? of the beam flanges induces plastic hinge away from the welds. In case of the HBS connections, plastic hinge develops at the heat treated beam section where steel strength is reduced by the heat treatment. As the beam flange dimensions, and the elastic and plastic moduli of steel are not altered in the HBS connection, the lateral and torsional buckling resistance of the HBS connection is higher than the RBS connection. Consequently, the HBS connections will dissipate a larger amount of energy with a minimum loss of strength or stiffness than the RBS connections. The proposed research will experimentally validate this novel seismic performance enhancement concept, and develop the design methodology for implementing the concept. The proposed research will conduct seven seismic experiments on the HBS beam-column connections to evaluate their seismic performance. The novel seismic performance enhancement technique will be validated on the welded unreinforced flange-bolted web (WUF-B) connection and hence an additional experiment on WUF-B connection (without heat treatment) will be conducted for reference. Strains, displacements and rotations at various locations will be recorded for investigating both the local and global failure mechanisms of the HBS connections. In the first step, a set of monotonic and cyclic material experiments on heat treated coupons will be conducted. The material coupons will be heat treated by exposing to various peak temperatures in the range of 800-1150oC and two hold times at peak temperatures. This set of material data will be analyzed to quantify the influence of heat treatment on material responses and used to determine the constitutive model parameters of the Chaboche model in ANSYS. A series of finite element analyses of the HBS connection using the Chaboche nonlinear kinematic hardening model will be performed to determine the optimum heat treatment parameters: i) maximum temperature and hold time, and ii) length of the heat treated flange section and, and iii) offset of the heat treated section from the column flange. The seismic performance of the HBS connection with i) both the top and bottom flanges are heat treated (new construction), and ii) only the bottom flange is heat treated (existing building) will be evaluated experimentally. Finally, based on the experimental and finite element analysis data a design methodology for the novel HBS connection will be developed.